VW L1 Prototype Gets Huge Mileage, Called Most Fuel-efficient Automobile in the World. Civility of the global crisis we’ve all become conscious that the car we’re about to buy – if we can afford one, has to be both sleek and fuel-efficient. However, since the offer is not that large, such a combination is hard to find. But not anymore! Straight from the halls of the Frankfurt Motor Show, the Germans from Volkswagen have taken the wraps off of their new L1 Concept Car which is dubbed as the “most fuel-efficient automobile in the world”. With a bullet-like design that makes it extremely slim, the new Volkswagen L1 Concept features great aerodynamics and lightweight engineering. Under its hood, the L1 packs a 39-hp turbo diesel engine along with a 14-hp electric motor that only uses one liter of fuel (or about a quarter of a gallon) to propel the car for 100 km or 62 miles – which translates to an unbelievable 240 mpg. A stylish piece of machinery, the new VW L1 prototype is capable of reaching 100 mph but only if you can afford pay for extra fuel as it consumes a huge 1.38 liters per 100km – which translates to 170mpg. 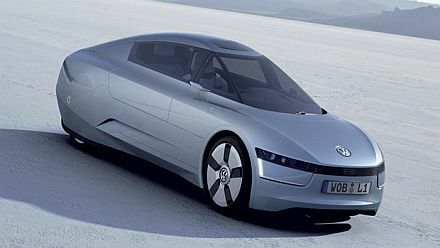 Word is that given its success at the German auto show, Volkswagen is considering production for the futuristic hybrid TDI vehicle and 2013 sounds like the year it’s going to be released.